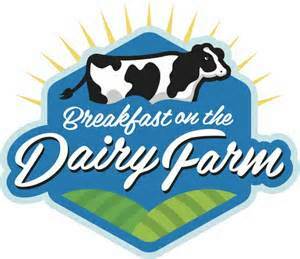 The Sheboygan County Dairy Promotion Association annually sponsors a "Breakfast on the Farm" as a dairy promotion fund raiser. It provides the opportunity for local people and visitors to the area to experience a dairy farm and witness different facets of family farming on different types of dairy operations in Sheboygan County. A variety of activities during the event make it an ideal fun educational experience for families. Each year the dedicated dairy farm family, hosting the event, unselfishly put forth endless hours of preparation in anticipation of welcoming thousands of guests to their family farm. We hope you will consider attending the event, experience a Sheboygan County dairy farm, enjoy a very dairy breakfast and support our efforts. The profits from this annual breakfast help to provide the resources to promote the dairy industry through "Addie" the Cow and to empower the Dairy Ambassador to provide FREE dairy presentations in classrooms throughout Sheboygan County. When at the Sheboygan County Fair consider supporting us by enjoying an ice cream treat at the little red barn or at our ice cream stand under the grand stand. We appreciate your visit to our website. If we can answer your questions or help you promote Wisconsin’s Signature Industry please do not hesitate to contact us. 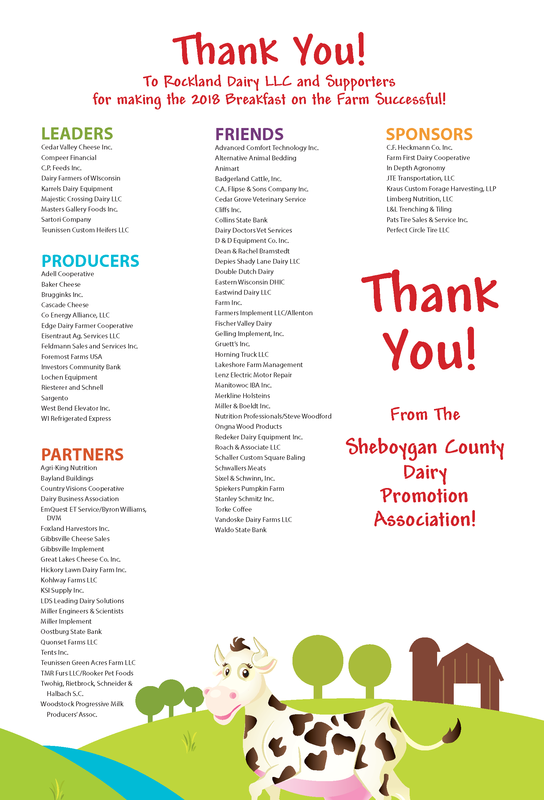 Sheboygan Co Dairy Promotion Assoc. 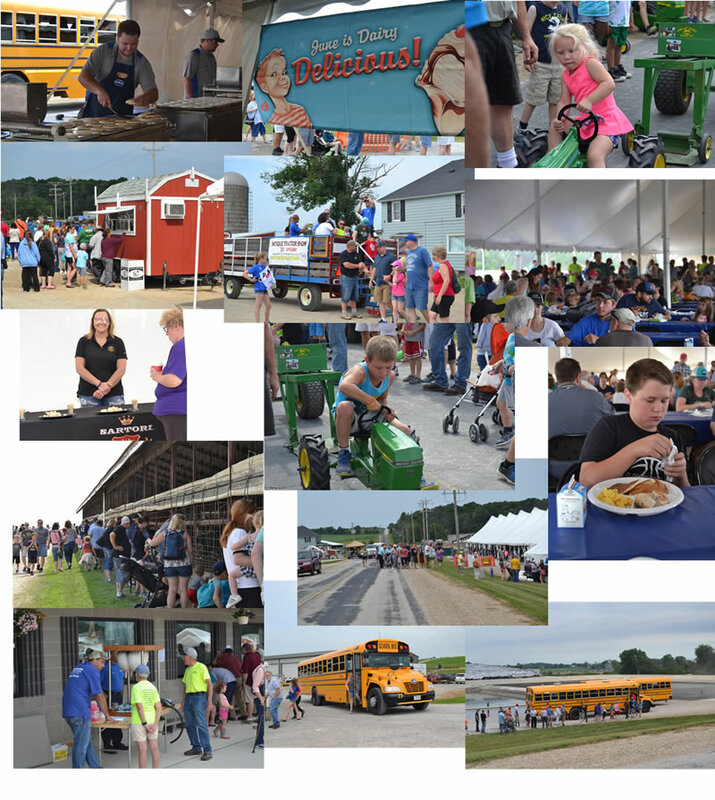 The Sheboygan Co Dairy Promo Team is looking for volunteers to help with Breakfast on the Farm on Saturday June 15, 2019. From setting up tables on Friday to serving/preping food to parking cars to cleaning up. We can use your help. Several shifts available. All volunteers get to experience a FREE truly farm breakfast. for hosting the 2018 Breakfast on the Farm. and promote the rapidly changing Wisconsin Dairy Industry. and to the long list of SPONSORS for their generous donations.